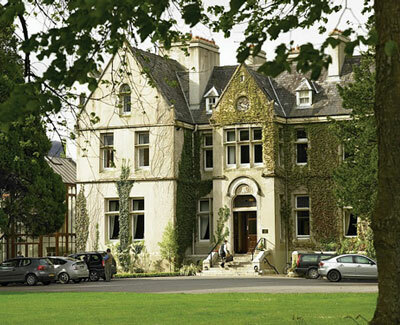 Cahernane House Hotel is situated on its own parklands on the edge of Killarney's National Park, an area of outstanding natural beauty with its untamed landscape of mountains, lakes and woodland walks. Cahernane House Hotel is situated on its own parklands on the edge of Killarney's National Park, an area of outstanding natural beauty with its untamed landscape of mountains, lakes and woodland walks. Only a 10 minute walk from Killarney town, the approach to Cahernane House Hotel is through a tunnel of greenery which frames the long private avenue and instills a slower, sweeter tempo and a true sense of tranquility. Formerly the residence of the Herbert Family, Cahernane House dates from 1877. In addition to impressive and comfortable reception areas, it features elegant and tastefully designed bedrooms and suites, many with antique furniture, Jacuzzis® and private balconies. In the gracious award winning Herbert Restaurant local produce is prepared with care and attention and the hotel boasts a highly impressive wine cellar which serves as a back drop to the charming cellar bar. One the house grounds enjoy croquet, tennis and leisurely garden walks. Play a round of golf at one of Killarney's beautiful championship courses.